The Barnaul plant in Russia has mastered the art of manufacturing affordable, yet reliable steel-cased ammunition. This ammo features a berdan-primed, non-reloadable steel case that is zinc-plated in order to prevent corrosion. This round features a 145 grain bi-metal hollow point that is ideal for range training or could even be used for self-defense. The 145 grain bullet is on the heavy end of the spectrum and has muzzle velocity of 1180 feet per-second. 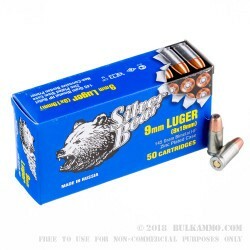 Silver Bear ammo has built a reputation for producing some of the highest quality steel ammo, so pick up a case of 500 and get out to the range! Q: Is the casing lacquer coated like the 223 brown bear? A: Hello Jonathan! 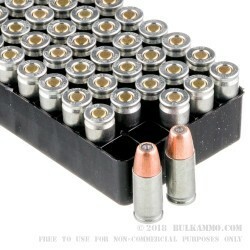 This Silver Bear ammunition is loaded in a zinc coated steel case. 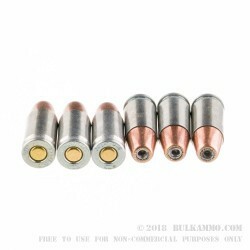 Q: What is the f/p/s of the bullets? A: Hello Edward, The velocity on this 9mm round is 1180 fps with a muzzle energy of 356 ft. lbs.